The great Namibian stand-off was close to breaking point. a couple of cubs at foot. Africa are unique in their hot, arid, desert nature. of Nations after World War One. temperature of about 10C is too cold to allow much evaporation. drama in wildlife reserves throughout the country. waterhole was not as fraught with danger as his colleagues imagined. not the least bit interested in zebra for lunch. zebra one by one venture to the prized waterhole. The animals recognise and do not fear the profile of the vehicles. the only way they know – attack. German enclave of Swakopmund on the coast and the Namib Desert. 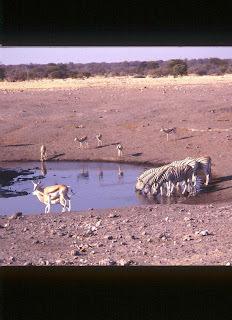 PARCHED waterhole in Namibia, scene of the great African stand-off. 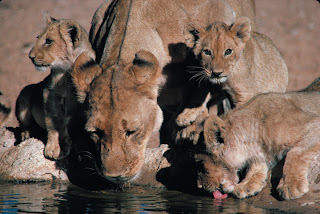 A LIONESS with cubs at a desert waterhole. OSTRICHES find little joy at this near-dry puddle.